John Savage-Onstwedder of Welsh producer Teifi Farmhouse Cheese is doing his bit to help Parmigiano-Reggiano producers in Italy after they were hit by two earthquakes in May. 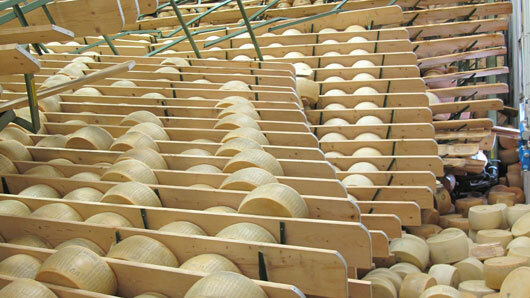 The quakes in the Emilia-Romagna region, which killed over 20 people, caused significant damage to the warehouses where the region's PDO-protected cheeses were stored. Around 10 per cent of the annual production (over 600,000 cheeses) were damaged as the maturing shelves tumbled to the ground. Around half of this had to be destroyed because the wheels had broken into pieces and mould had developed, while those that had suffered less severe damage were destined to become generic cheese for grating and making cream cheese. That was until John came up with the idea of the Save a Cheese Campaign in support of his fellow raw milk cheesemakers. He is offering Brits the chance to buy their own piece of 'quake cheese' at www.saveacheese.com, which will be delivered to their door. The bulk of the money will be paid to the individual cheesemaker with one euro per kg going to the Parmigiano-Reggiano Consortium for distribution to other cheese producers affected by the earthquakes. The cheese retails for £22 per 1kg wedge (incl postage and packaging) and is stamped with the ‘Save A Cheese’ logo.